indication of internal abnormalities like brain tumours, abdominal mass, etc. This would be the beginning of a very traumatic time for such patients and their families, as they struggled to cope with further treatment. But besides the costs, he realised that travelling to larger hospitals in South Mumbai and western suburbs for tertiary care was equally, if not more, draining on both patients as well as their care givers. As he puts it, “I would see patients running from pillar to post for their tertiary healthcare. There were about 2000 primary and secondary healthcare beds in Thane and surrounding areas, but there wasn’t a single tertiary care facility. If even 10 per cent of these 2000 patients need tertiary healthcare, you can definitely provide this care in Thane.” And this was the rationale for shutting his successful imaging clinic and turning entrepreneur. Leading a group of doctors, he shortlisted a location close to the arterial Eastern Express Highway, which was easily accessible to residents from nodes around Thane, like Mulund, Bhiwandi, Airoli, MIDC and SEEPZ as well as Navi Mumbai. A little more that 22 km away and an hour’s drive from Mumbai’s International airport, the three acre Thane facility, which was inaugurated in 2007, also sees a fair share of patients from different states of India as well as overseas. Today, Jupiter Thane is a tertiary care centre providing comprehensive healthcare in all segments, from birthing to geriatrics and end of life care, ‘a community hospital’. Equipped with 350+ beds across seven floors, the facility reportedly houses a cancer care clinic, cardiac care including open heart surgeries, the region’s largest paediatric facility with a 50 bedded Children’s ICU, as well as a liver and kidney transplantation facility. On the accreditations front, Jupiter Hospital Thane became the region’s first NABH accredited institution. Expanding on the philosophy behind the group, he says that besides being a community hospital, as the promoters are all doctors, they were clear that the group should offer learning and teaching opportunities for the doctors and clinical staff themselves, along with clinical care for patients. Thus post graduate education became a major thrust. Currently the group has more than 50 students doing their DNB post MBBS, for three years. They also have teaching programmes in orthopaedics, paedriatrics, anesthesia, radiology, radiotherapy, surgery MUHS post MS, programmes in critical care. 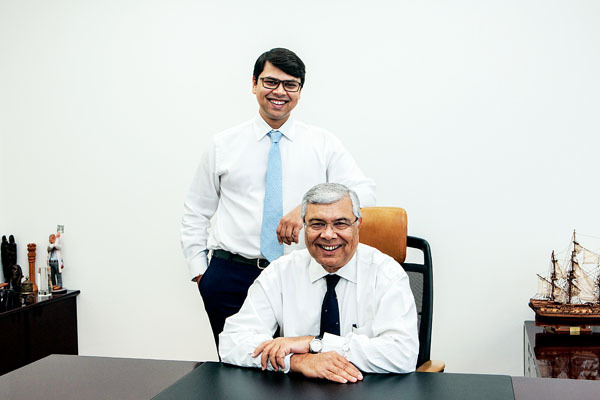 With the first facility in place and thriving by the fifth year, the management, led by Dr Thakker decided to expand to a second location. Pune as a city was an obvious choice due to its proximity to Mumbai, which meant that the promoters could monitor both Thane and the upcoming facility very easily. Within Pune, the promoters zeroed in on Baner because it is a newly developed node with a population of about a million residents, but with no healthcare facilities within 5-6 kms. Situated near Prathamesh Park, Baner, this is a strategic location that helps to cater to the healthcare needs of surrounding major nodes like Aundh, Balewadi, Pimpri and Chinchwad. Like Thane, this zone lacked tertiary healthcare facilities and patients had to travel to the main city for secondary and tertiary healthcare. Built over a period of two years, the Baner facility currently has about 150 operational beds, spread from the ground to eighth floors, with all OPD and diagnostic facilities located conveniently on the ground floor. Dr Thakker mentions that once all 13 floors are fully commissioned, it will have around 350 operational beds. Baner is due to have its first NABH inspection in September, and after required changes are made based on the findings, it is expected to get its accreditation in October. He emphasises that the accreditations are important to sensitise the whole staff of the facility to the importance of having systems and processes in place, not just in terms of legality, but also to ensure continuity of care and patient safety. The hospital segment has seen a wave of consolidation, with mega acquisitions like the Fortis- IHH Healthcare hogging the headlines. But there are many smaller strategic buyouts which help expand the footprint of a clinical strong player like the Jupiter Group. For instance, Apollo Hospitals acquired a 50 per cent equity stake in Lucknow based 330 bedded-Medics Super Specialty Hospital to strengthen its position in the North India market. But while this may seem an attractive strategy to build a network in Tier II, III, and IV towns, Dr Thakker remains a firm advocate of greenfield rather than brownfield projects. While patients flock to Mumbai for treatment, observers point out that setting up a hospital as well as the cost of healthcare in some smaller cities could in fact turn out to be much more affordable for both hospital managements as well as patients. Dr Thakker acknowledges this fact. Pune for instance, is about 15 per cent cheaper than Mumbai, due to the lower cost of land, infrastructure, human resources. The cost of living in Pune is therefore lower so patients would find it more economical, provided they can get the same level of care. But this logic does not extend beyond a certain point. Dr Thakker reasons that cost is a function of the medical condition. Certain procedures, like for example liver transplants, require a huge number of consumables, like drugs and equipment, which might need to be imported or are made only by MNCs. For these kinds of procedures, the cost will not differ much between cities because the requirement and therefore cost of consumables would remain the same beyond a certain point. Inflation over the last decade has hit all business sectors and healthcare entrepreneurs like Dr Thakker are no different. Comparing the costs of putting up the two facilities, he says, “When we started on the Thane facility (around 2005), the rupee-dollar exchange rate was INR 42/43. Today it is INR 70 to the dollar. So if the installation cost per bed in the Thane facility was INR 60-65 lakhs, today its above INR 1 crore, minus the cost of the land. So inflation does impact the installation cost. Similarly, the costs of other components required to put up a hospital like steel, cement, labour, etc have also gone up.” Thus the Baner facility, projected to have a final bed strength of 350 operational beds, signifies an investment of INR 350 crore for the Jupiter Hospital management. The rupee-dollar rate is particularly relevant to the healthcare sector as most biomedical equipment have to be imported. While promoters are hit by inflation, there’s a limit to how much costs can be passed on to patients. He points out that the cost per bed could escalate even more without tight control of expenses. But while INR 90 lakhs to a crore is the minimum installation cost for a bed in a comprehensive tertiary care hospital, it could be less if the facility does not provide specialised services like heart care, etc. If the promoters of a hospital decide to not provide cancer care, their costs drop because they can do without certain high end equipment, For instance, they wouldn’t need linear accelerators (LINAC), which reduces the cost of the facility by INR 20 crore. Similarly, they wouldn’t need a PET CT scan, which costs around INR 10 crore. Thus that’s a reduction of INR 30 crore, from the projected capex of a hospital under construction. “Cost is a function of the technology the hospital has,” explains Dr Thakker. For instance, Jupiter Hospital has a 128 slice CT scan. A CT scan can cost anything between INR 1 crore to INR 7 crore. An MRI can cost between INR 3-11 crores. So there is a huge delta. As Dr Thakker elaborates, “We don’t compromise on technology because we know that having bought it, we have to use it for the next 10 years. What is best today, might be just usable after 10 years. So we need to look at technology which will last for at least 10 years without getting obsolete. Obsolescence is a big challenge, especially in a tech driven sector like healthcare.” Therefore the strategy at Jupiter Hospitals is to buy top-of-the-line technology; whether its the 128 slice CT scanner, the 3 Tesla MR, dual energy stereotactic LINAC, or the multi slice PET. Dr Thakker believes that while personal skills are important, healthcare is no longer driven by personal skills alone, but by technology. As an example, he points out that even a highly skilled surgeon will not be able to perform as well during a laparoscopic surgery without high definition cameras. There are certain similarities in the architectural layout of both the Thane and Pune facilities. Like the use of space and light and providing step out gardens wherever possible. The staircase from both lobbies are wide and branch out into two, giving patients and relatives ample space to navigate. Dr Thakker stresses that the first and foremost priority while designing a Jupiter Hospital is patient privacy. For example, he points out that even the twin sharing rooms in Jupiter Hospital’s Pune facility are more like private rooms. They are partitioned from top to bottom, with individual air conditioning/HVAC controls as well as entertainment units. Except for sharing a bathroom, they are in a private room. So for the same cost, the hospital management did an architectural change to give the patient complete privacy. Another design element that stands out are the large bay spaces, which ensure patients’ families do not feel crowded. Patients and their families at the Pune facility can even sit out in an indoor garden on the sixth floor called Shanti Niketan, complete with palm trees, etc. with enough light and sun. The upper floors overlook this garden so patients and their relatives of these four floors can also connect with nature, which brings its own peace of mind. Jupiter Hospitals thus finds itself in its 11th year, with two operational facilities. The pace might seem slower than other hospital groups but could prove to be more sustainable in the long run. And the pace could be picking up, with senior Dr Thakker actively scouting for an appropriate location for the third facility while his son starts the ground work for the group’s first overseas foray. The third hospital, like the first, will be in a suburb of Mumbai, currently lacking tertiary care facilities. Will the slow and steady strategy serve this group well? Or will the promoters decide otherwise? Only time will tell.